An extended and well maintained three bedroom semi-detached family home, situated within a peaceful close in Tilgate. 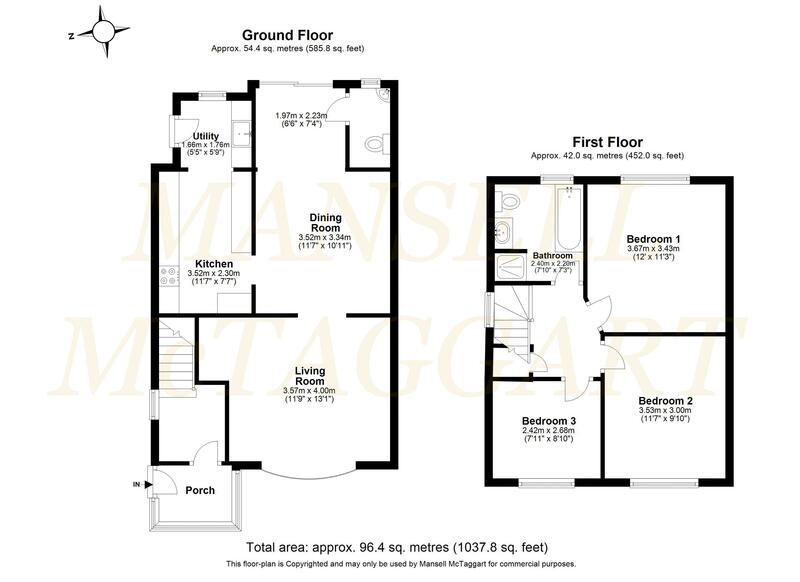 The property which benefits from a front and rear extension is accessed via the porch with ample space for shoes and coats and an internal door leading to the entrance hallway with window to side and stairs rising to first floor. On your right is the living room with a bay window to the front aspect allowing in plenty of natural light with an archway leading to the spacious dining room which is open to the rear extension allowing wonderful family space and capacity to hold a six/eight seater dining table and chairs perfect for entertaining guests with patio doors leading to the rear garden. This also gives access to the cloakroom with a low level WC and corner wall mounted wash hand basin. To the left of the dining area is the kitchen which also forms part of the rear extension and comprises a range of wall and base units incorporating cupboards and drawers with work tops over, integrated under counter fridge and freezer with space for a freestanding oven and space and plumbing for washing machine, a Belfast sink unit, small breakfast bar, wall mounted boiler (2015) with window and door to side. Stairs from the entrance hall take you to the first floor landing giving access to all three bedrooms, family bathroom, as well as access to the loft via a pull down ladder and a cupboard housing the water tank. Bedrooms one and two are both good sized double rooms overlooking the front and rear respectively, with bedroom three being a good sized third bedroom overlooking the front. Finally, the family bathroom comprises of a panel enclosed bath, low level WC, wash hand basin with storage beneath and a separate shower cubicle with wall mounted shower unit and opaque window to rear. Outside the front of the property has off road parking for one vehicle laid to gravel with some planted raised flower beds which could be turned into additional parking and a shared driveway leading to a detached single garage with additional parking space in front. A South facing landscaped rear garden with a patio area abutting the foot of the property and a garden path leading to a decked area to the rear of the garden, all enclosed by wooden panel fencing with a variety of raised planted hedge and tree borders. There is a single garage with up and over door, power and light. The property stands on the favoured southern side of Crawley close to Tilgate Forest with its selection of water sports, bridle paths, forest walks, golf course and close to the local shopping parade providing a number of restaurants/takeaways, convenience store, drycleaners and public house. Additionally, there are excellent sports facilities at the K2 Leisure complex and Crawley town centre, with its extensive range of shops, inns and recreation facilities. Crawley and Three Bridges railway station (Victoria/London Bridge approx. 35 minutes), are a short distance by car. Gatwick Airport and Junction 11 of the M23 are also within easy reach. Schools Desmond Anderson School, The Oaks Primary School, Thomas Bennett Community and Oriel High School.